I have a weakness for chewy sweet candy. I just have to have something sweet when I'm at the movies or when my kids come from a birthday party I dig in their grab bags and pick out a piece of candy to enjoy. I know, I know, not healthy, but everyone has a weakness. 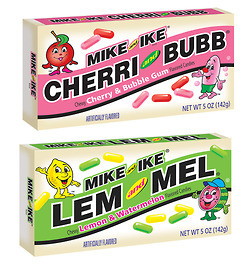 Last week we were sent a few boxes of Mike and Ike's original retro flavored candy, Cherri and Bubb and Lem and Mel. My kids noticed the difference in the box right a way. So the hubby and I explained to them that the design on the box was from when Mike and Ike first came out. The verdict on the original flavors turned out great, my kids loved them. Both retro flavors combine two great tasting fruits for a sweet and unique combination. CHERRI AND BUBB is a blend of Cherry and Bubblegum flavors and LEM AND MEL is a mix of Lemon and Watermelon flavors. These delicious retro treats are hitting shelves now and will only be available through April 2013, get them while you can! (Retro Mike and Ike only available in the USA) You can keep up to date with Mike and Ike on their website, Facebook and Twitter! Disclosure: All opinions are my own. I received samples of Mike and Ike at no cost for the purpose of sharing this news. No other compensation was received.